Barry Kent MacKay, Senior Program Associate for Born Free USA, is writing a special blog series about deer culling. Below is the first installment. Killing is how we solve problems, I thought, as I listened to the news in my hotel room in Victoria on Vancouver Island, British Columbia. President Obama had requested authorization for use of military force against terrorists in the Middle East. In my country, Prime Minister Stephen Harper was beating the war drums, his promise that Canadian troops would act only as advisors and not come under fire in Iraq, shattered. That was big stuff involving war leaders and world events, and seemed very distant from the determinedly civil environs of Oak Bay: a municipality of the Capital Regional District, collectively called Victoria, B.C. It was a residential jurisdiction filled with lush gardens, quaint pubs and tea shops, golf courses and schools, a marina, and an appealing mixture of ivied mansions and more modest but attractive residences. And yet, the night before, I had attended a meeting of Oak Bay council, where the issue was killing - not people, but deer. As happens across the continent, municipal politicians had received complaints that there were "too many" deer. So, as is typical of our species, the response was essentially, "Well, let's kill some of them." Killing has universal appeal as a problem-solver. Here, the two main issues seem to be that the deer were eating garden plants, and that they posed a risk to drivers, children, and the elderly. Not even excepting the American southeast, I don't think I have seen gardens more lush than in Victoria - and it was February! Back home, there were no flowers; just snow. More to the point, in exploring the streets, parks, golf courses, and school grounds of Oak Bay, I saw virtually no signs of the heavy browse lines or denuded foliage one finds when deer populations are high. "What's a browse line?" I was asked by locals. 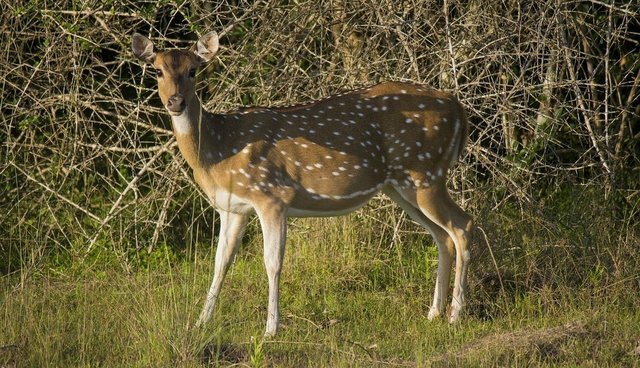 It is the line that appears at the highest point deer can reach when consuming vegetation. If the vegetation is denuded below that line, it means food for deer is getting scarce. Even when there is a distinct browse line, the deer are often healthy. In Oak Bay, in spite of driving and walking through the community, I saw one deer, and she appeared to be in splendid health. These deer are not over-populated by any definition. They are part of the environment, and it is an environment that, like every other, changes through time and puts limits on what can be grown. I can grow a fraction of the variety of plant species that gardeners enjoy in Victoria. The other problem I most often heard was that there were collisions between deer and cars. We have a demonstrably successful program in Ottawa, Ontario called "Speeding Costs You Deerly" that works well, yet I encountered no indication that the District would even consider such non-lethal options. But, the real irony is that the cull will not work-and residents will likely never know - because the council has decided to spend taxpayers' money killing deer with virtually no consultation or accountability. We don't even know, as of this writing, if the cull has started. When asked directly at the council meeting, the mayor said he would not tell residents when the cull began. Deer culls typically result in what is called "rebound effect" or "compensatory mortality," which means that, when a population is decreased, females become more fertile, natural mortality and competition for resources are reduced, fawn survival is enhanced, and, in consequence, numbers increase above what they were originally. But, when we analyze the data, we find that the number of collisions are low and that most occur on three particular roads (where there need to be lower speed limits that are properly enforced, as well as better signage, which would go a long way to reducing collisions and the number of cars damaged and the number of deer hurt or killed). The deer involved are of the "black-tailed" race of the mule deer. They are native to Vancouver Island, where they are in severe decline in their traditional forest habitat. But, their numbers are "exploding," according to Oakville mayor Nils Jensen. Whenever any wildlife species increases, we are told that its population is "exploding." No one knows how many deer are in Oak Bay, and after searching it from top to bottom for a week (and seeing only one) and having done wildlife surveys, I would think that anything approaching an accurate count would not be possible. No matter; no effort has been taken to determine what number would be "satisfactory." (Zero?) And, at any rate, the council has decided that it can afford to kill up to 25 deer without bothering to consider if that is enough, if it is too many, or if it will have any effect on population size at all. Those will not necessarily be the ones munching the tulips or being hit by cars - but those unlucky enough to enter Clover traps. These are cage-like frameworks covered in mesh and baited with food. The animal enters the trap, trips the trigger that closes the door, and, trapped, waits until people arrive to jump on the trap, collapsing it onto the deer. One holds a "captive bolt" gun to the deer's head and fires it, sending a stout piece of iron into the animal's brain. Once the animal is dead (or, preferably, unconscious with the heart beating), it must be "bled out" quickly (if, as the law demands, the meat is to be saved). That part is uncertain, because Mayor Jensen believes in levels of secrecy more often associated with military planning. Did he or did he not get an exemption from what the law requires? In future blogs, I will more carefully explain why this cull is both cruel and ineffective, look at alternative actions, and explore the thinking - so commonplace - that leads us to so quickly choose killing as the solution to our problems.